Both Niger and Nigeria get their names from the magnificent, River Niger. How the river got its name, remains a mystery. It is a very unusual and most important river to both countries. The Niger River is the third largest in Africa, after the Nile and the Congo. It is nearly 2600 miles long. What makes the river so unusual, is its route. The river’s source is only 150 miles from the Atlantic Ocean in the ancient rock of the Guinea Highlands, but instead of heading toward the ocean it flows away from the sea, into the Sahara Desert. It is a crescent shape and makes its turn near the ancient city of Timbuktu, in Mali. It then flows south, though Niger, Benin and Nigeria, where it finally ends, at the Niger Delta, in the Gulf of Guinea of the Atlantic Ocean. It also floods each year along its route, making a marsh area that is valuable for farming, fishing and wildlife. The river is known to be clear, with very little silt. Both countries are located in West Africa. Niger has seven neighbors: Libya to the northeast, Chad to the east, Nigeria and Benin to the south, Burkina Faso and Mali to the west and Algeria to the northwest. The country is landlocked, with eighty percent of the land, covered by the Sahara Desert. The land area of Niger is the largest in West Africa, however, most of the population lives in the far west and south of the country. The country’s nickname is “The Frying Pan of the World.” Yes, with its subtropical climate, it is one of the hottest countries in all the world. Niger gained Independence from France in 1960 and has since had five constitutions and three periods of military rule. Since a coup in 2010, Niger has become a democratic, multi-party, state. The population, of nearly 19 million, lives in rural areas. The capital city, is now Niamey, located in the southwest corner of the country. Prior to 1926, Zinder was the capital city. The economy is based on subsistence crops, livestock and uranium mining. Niger’s population is made up of several ethnic groups. The three largest are: the Hausa, Zarma-Sonrai and the Tuareg. The Tuaregs are often referred to as the” Blue people”, for the indigo, dye-colored clothes they wear, which stains their skin. They have been one of the ethnic groups that have been historically influential in spreading Islam to the region. Islam is the prevalent religion of Niger with eighty percent Islam and the balance mostly Christians. French is the official language, along with ten others commonly spoken. Most of the population speaks their indigenous language as their first language. Unfortunately, Niger faces extreme challenges. Aside from being one of the poorest nations on earth, it has one of the highest birthrates in the world. Each Niger woman has on average, seven children. The median age of the population is a very young, 15 years. The literacy rate is only 28 percent; one of the lowest in the entire world. Poor education, lack of healthcare, environmental degradation, overpopulation and drought all add to these challenges. Most recently the government has had to also deal with the Islamic terrorist, jihadist group called, Boko Haram that is wreaking havoc on its border with Nigeria. The country, in its landlocked position, faces additional challenges from turmoil all around it. While the country does get some assistance from other nations, much work needs to be done to pull its citizens out of poverty. Despite all the hardships that the people of Niger face, they go about their daily life and have celebrations and festivals that are deeply rooted in their histories. Nearly every ethnic group in the region comes from an empire that ruled the area at one time or another. They have many traditions. The Salt Cure Festival and Guerewol Festival are two important ones in the country. Niger also has some very important national parks; one in the north called, Air and Tenere National Nature Reserve and one in the south, where the W National Park has the most important population of the rare, West African lion, and the one of the last populations of the Northwest African cheetah. Other wildlife includes elephants, buffaloes, antelopes and warthogs. The Niger River is also home to the endangered, West African Manatee, as well as 250 fish species; twenty of which are found nowhere else on the planet. The main staple crops are millet and sorghum. These are made into stiff porridges and enjoyed alongside sauces, soups and stews. Rice is also available and grown in the marshes. The soups and stews are typically made of vegetables and peanuts, as meat is somewhat scarce. The river provides fish as a needed protein and beans are also popular. Like many African countries they like a bit of spice in their cuisine. Nigeria also gets its name from the River Niger. Aside from Niger to the north, its neighbors are: Chad to the north, Cameroon to the east, Benin to the west and the Atlantic Ocean to the south. Unlike its neighbor Niger, it is one of the wealthiest countries, due to oil and other mineral resources. It is part of OPEC and the twelfth largest producer of oil in the world. It accounts for 85 percent of the government’s revenue. Despite its richness, 62 percent of the population lives in poverty. This is due to mismanagement and corruption. Nigeria is the most populated country in all of Africa and eighth most populated in the world. It is home to nearly 190 million people. It is believed that one of five Africans, is of Nigerian descent. Its nickname is “The Giant of Africa.” The population of Nigeria is made up of more than 250 ethnic groups. The largest and most politically influential are: the Hausa, the Fulani and the Yoruba. English is the official language, as they gained Independence from Britain in 1960. However, more than 500 languages are also spoken. The religious makeup is: 50 percent Muslim, who live mostly in the north, and 40 percent Christians, who call the south home, and the balance is a mix of indigenous beliefs. The divide between the north and south continues to be a problem for the government. The current president, Buhari, a northerner, elected in 2015, has spent two long stents out of the country on medical leave. He has recently returned and is hoping to calm political disputes that have escalated in his absence, along with making good on his promise to face the war with Boko Haram. The country has made strides to take territory back from the Jihadist group but are now facing terror threats on soft targets. Boko Haram is using children as suicide bombers in crowded market places. You may remember hearing about the young school girls who were kidnapped by the Boko Haram in 2014. Some have been found but many are still missing. With the country in recession, the government must work quickly to make opportunities for its young population, to keep them away from religious divides and civil war. The population average in Nigeria is also a very young, 18 years of age. There is much work to do in Nigeria especially in regards to infrastructure, power supply, sanitation and clean water. If the president makes good on his promises to curb and squash corruption, there should be plenty of money to be used on these most important projects. There are other opportunities in the large cities. For example, “Nollywood” as it is called, is the second largest producers of movies behind India’s Bollywood. Telecommunications, along with finance and information, are growing industries in Nigeria. Many of these growing industries are located in Lagos, the largest city in all of Africa. It is the financial hub and commercial capital of the country. Lagos used to be the capital city, which was moved to Abuja in 1991. Lagos sits on the Atlantic coast, has many beaches, including the Ancient Slave Port of Badagry, which was also known as, “The Point of No Return.” Today the area serves as an important place for reflection. As we look into the cuisine of these two West African countries, they are very similar to the region as a whole. They both use millet, sorghum, cassava, corn and rice as staple ingredients. Protein sources, like meat and chicken, are available to the wealthier people in the countries. Fish from the River Niger, like carp, Nile perch and catfish, are all loved by all. Melon seeds, which come from a gourd, somewhat shaped like a watermelon, called egusi, are a source of protein as well. They are not only delicious, when toasted, but are used as a thickener in soups and stews. Fruits, like mangoes, pineapple, oranges, melons and bananas, are available in the tropical areas. Yams are an important crop in the eastern areas. Peanuts are also a common ingredient in the cuisine, as is spice; they like it hot. Alcohol is not consumed in the Muslim areas of the countries but local beers are enjoyed in the South of Nigeria. Palm oil is the most used cooking oil in the region. 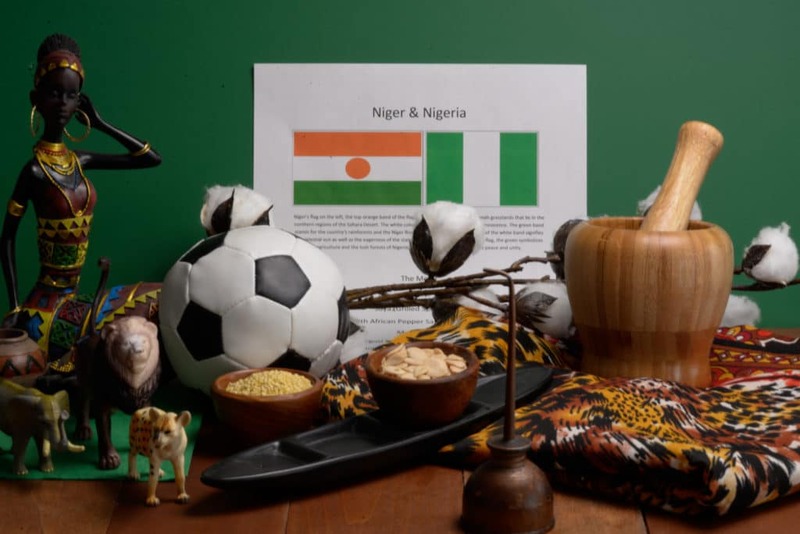 We set the scene with the colors of the two nation’s flags; green and white, which they both share, plus Nigeria also has orange in the mix. Millet and melon seeds, representing their staple ingredients were added and cotton and peanuts, as they are important export crops. A canoe was placed to represent the importance of the River Niger, for trade, and transportation. An oil can was included to represent the wealth of Nigeria. A few African animals joined the scene for the important reserves in both countries and to promote their protection. 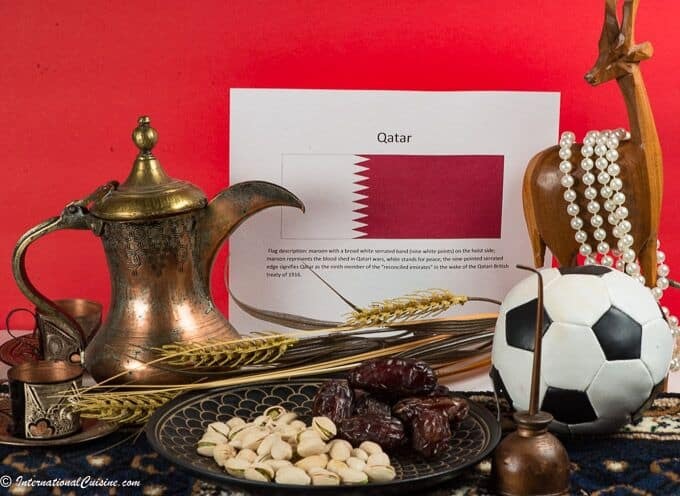 Lastly, a soccer ball was placed, as it is the national sport of both nations. We sat down at our low table and began with suya , which is a well-loved street food in the Hausa regions of both countries. It is incredibly popular all over West Africa and I have made it, with both beef and chicken, for two other West African countries; Cameroon and Ghana. When I am asked “what is one of my favorite dishes, I have cooked so far?, this one will always be on the list. It is definitely spicy, but you can make it to meet your heat tolerance. Served alongside was the African pepper sauce; simply heaven! I was thrilled to make it again and included a video to show you how quick and easy it is to make. For the main course I used a new ingredient to me, called egusi seed. This seed looks most like a pumpkin seed but perhaps a bit smaller and has a wonderful, nutty flavor. I love to eat them straight from the jar. I also bought a jar of grounded egusi seed that I used in the recipe. It is called a soup, however, it is more like a thick stew or sauce that is typical in African cuisine and to be enjoyed alongside fufu, or rice. We absolutely loved it. I was able to get smoked catfish from my African market, which added a remarkable, smokiness to the dish. It also had beef pieces in it. The soup, as they call it, also has a ton of either bitter leaves or spinach in it. 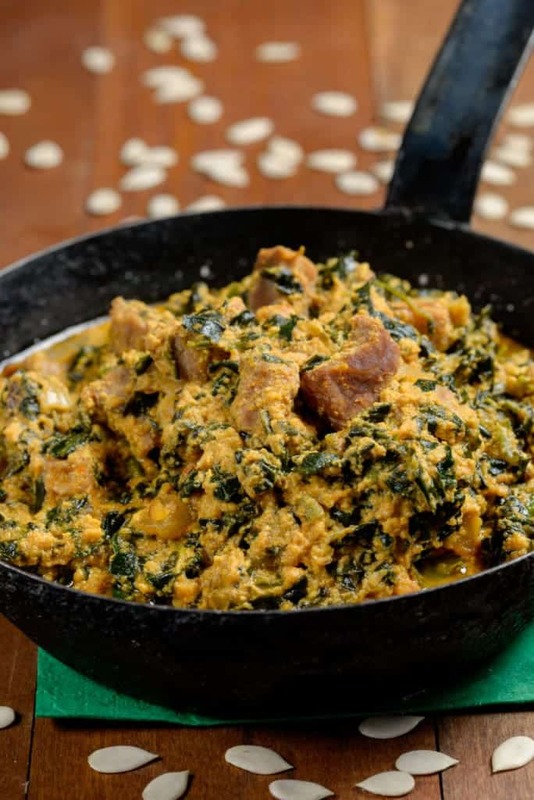 The egusi soup, with rice, is a well rounded and delicious meal. 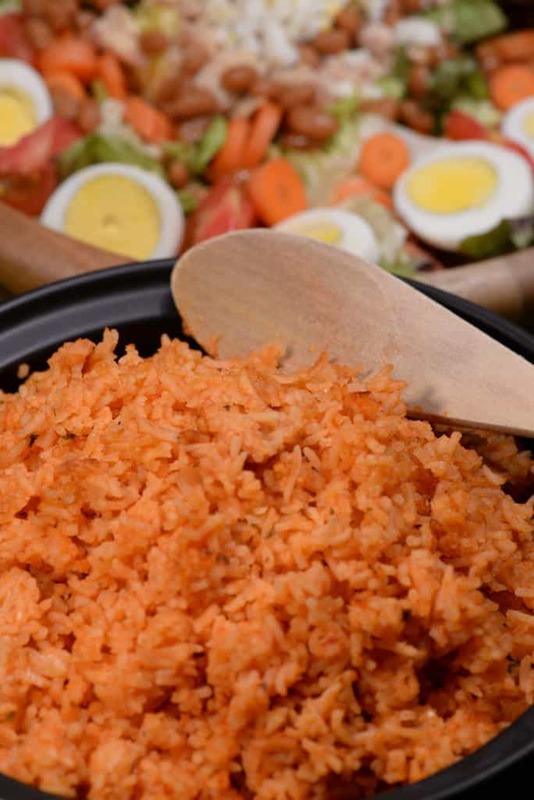 I have included here the recipe for jollof rice. I did not make it for this particular meal but since it is considered to be the national dish of Nigeria, I wanted to make sure to include it. It is a spicy dish of rice, stewed in a flavorful, tomato broth. It is often eaten as a main dish. 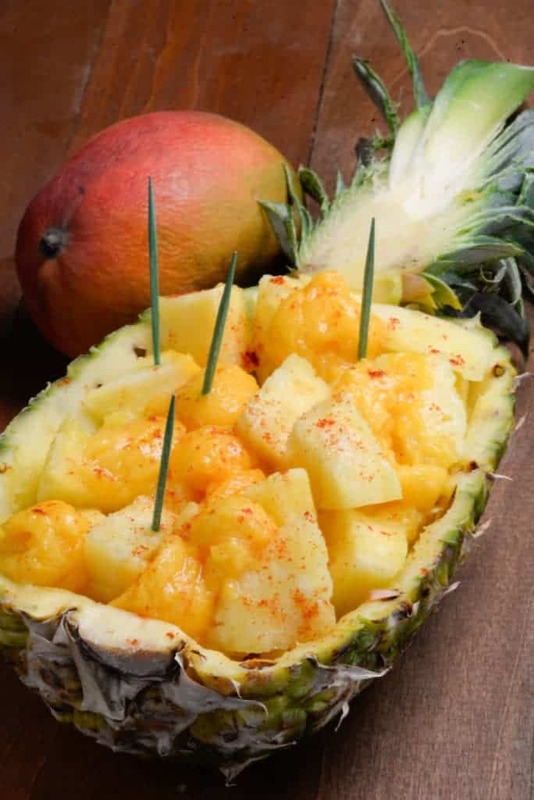 For dessert, fresh mangoes and pineapple, were a perfect ending to the spicy West African flavors that we have learned to love. 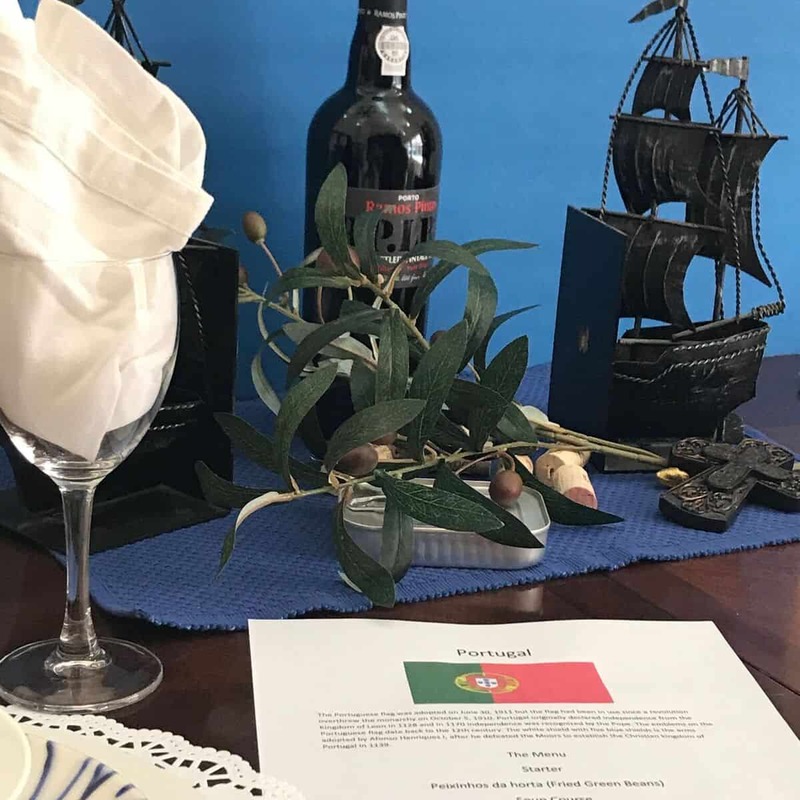 As we say goodbye to these countries that both face so many challenges, we do so with a prayer for their impoverished people, that life, somehow gets a little bit easier and the governments work harder to do the right thing for their people. And also, that somehow they can end the terrorism of the Boko Haram and live in peace.